The US-think tank Ethisphere Institute has recognised Rezidor, for the third consecutive year, for its real and sustained ethical leadership. 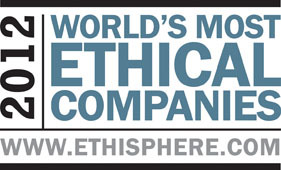 "We are very proud that we have maintained our status as one of the World"s Most Ethical Companies since 2010. We are on a long term basis committed to a responsible way of doing business. We translate words on ethical practices into action, create innovative ideas to benefit the public, and raise the bar for standards within our industry", said Kurt Ritter, President & CEO of Rezidor. The sixth annual selection of the World"s Most Ethical Companies saw a record number of nominations and applications from companies in more than 100 countries and 36 industries. The methodology for the award includes reviewing codes of ethics, litigation and regulatory infraction histories; evaluating the investment in innovation and sustainable business practices; looking at activities designed to improve corporate citizenship; and studying nominations from senior executives, industry peers, suppliers and customers. "This year"s winners know that a strong ethics programme is a key component to a successful business model, and they continue to scrutinize their ethical standards to keep up with an ever-changing regulatory environment", said Alex Brigham, Executive Director of Ethisphere. Rezidor"s group-wide Responsible Business Programme has its roots as far back as 1989. Besides the respect for social and ethical issues within the company the programme also focuses on health and safety for guests and employees, and on a reduced negative impact on the environment. The Responsible Business Programme is compulsory to all employees and hotels, and is also reflected in the "Always Care" motto of Rezidor"s renowned Safety & Security Programme TRIC=S. The group supports charity organizations such as World Childhood foundation, partners with responsible players like World Cleanup 2012, and has signed to the UN Global Compact and Caring for Climate initiative. One of the latest developments within the Responsible Business Programme is the five years energy saving project "Think Planet".